Annan Athletic at last got a victory over one of the top 3 teams in the league due to a much improved second half performance. It was a game the Spiders will look back on with some regret particularly in the first half when Annan were under constant pressure against the slick moving Hampden Outfit. It was however a crucial victory for the Galabankies and one which keeps their hopes of a top four play off place still alive. The fact that Annan were still in the game at half time was due to some resilient defending and some fine goal keeping by initially Alex Mitchell who had to leave the field injured after a challenge by Jordan Moore left the Annan keeper with an injured back. The injury presented the Annan fans with their first chance to see how on loan keeper Jordan Hart performed in his first taste of SPFL League 2 action and the young Celtic keeper did not disappoint with a faultless display. The second half however was a different story with the re-arranged Annan team taking the game to Queens Park and scoring two goals and importantly it was only the second time this season that Annan did not concede a goal. Queens Park started very positively with full back Shaun Rooney causing all sorts of problems down the right flank and in the opening ten minutes Rooney swung in inviting telling crosses which tested Annan’s defensive capabilities. Annan had a real let off in the 12th minute when Mitchell saved in a goalmouth scramble with strong claims from the Queens Park team that the ball had went over the line. It was all one way action, Annan’s first real attempt on goal came in the 18th minute when Muir pulled off a good same low down from Todd’s well struck shot. Paul Woods and Darren Miller were pulling the strings in the middle of the park for Queens Park and shots from both these players missed the target. 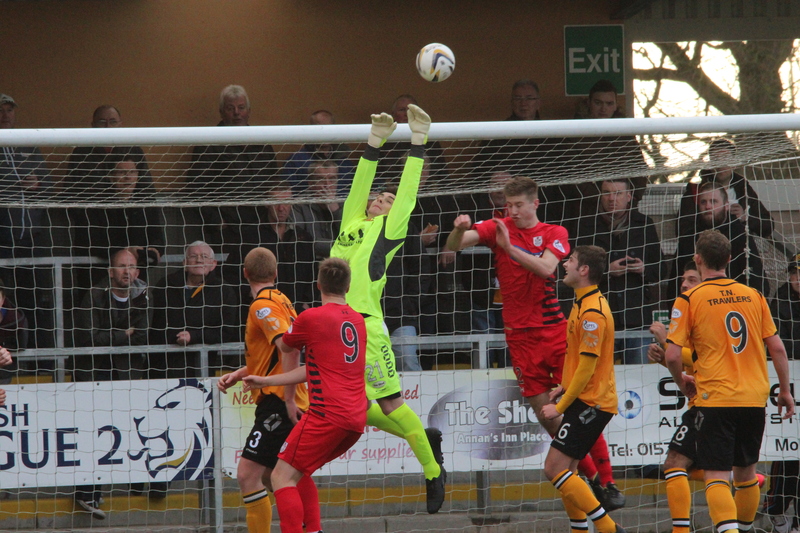 Miller’s 24th minute free kick struck the outside of the post as Annan’s good fortune continued. Annan’s Matty Flynn connected beautifully with a ball played in from the left from Scott McColm with the shot just missing the target. Mitchell then pulled off an important save to deny Paul Woods and the same players shot through a ruck of players then forced Mitchell into another important save before the Annan keeper had to leave the field injured. The pressure continued with Queens Park forcing several corners all aimed at the heart of the Annan defence with Hart displaying confident handling to pluck all the corners out of the air. Annan started the second half with several positional changes. Keiran Brannan was replaced by Rabin Omar with Andy Mitchell slipping into the right full back position and Black playing immediately in front of the back four. The changes had a positive effect on the Annan team who started the half taking the game to Queens Park. Josh Todd opened the scoring in the 50th minute when he latched on to Blacks shot from an acute angle which cannoned off the post. Muir then pulled off a super save to deny McClom and forcing Annan’s first corner of the match in the 55th minute. Peter Weatherson increased Annan’s lead in the 59th minute with a super strike when a long ball played from defence caught the Queens Park defence on the turn and Weatherson picked the ball up 35 yards out looked up, spotted the keeper off his line and lobbed the ball over the keepers head. Queens Park made a couple of changes with Carter and Hines replacing McElroy and Miller in an effort to try and retrieve the situation. The match then entered a 15 minute period with both defences on top before the spiders put the Annan defence under late pressure with Hart pulling off an important save low down to deny Carter and minutes later Paul Woods finished a good move with a shot over the bar. Hart saved Ross McPhersons 84th minute effort. It was a late flurry from the spiders and when full back Shaun Rooney finished a penetrating run with a shot which went narrowly over the bar you sensed that Queens Park were not going to score. With all the top 3 teams losing Queens Park did not lose any ground at the top of the table and it is getting tighter in the middle third of the table with four or five teams looking to slip into the play off zone. The next 3 games for Annan against Arbroath, East Fife and Clyde will go a long way to determining if Annan can maintain a push for the play off places. ANNAN ATHLETIC: Alex Mitchell (Jordan Hart 34 min), Keiran Brannan (Rabine Omar ht), Steven Swinglehurst, Martin McNiff, Peter Watson, Steven Black ( Junior Ogden 70 min), Andrew Mitchell , Mathew Flynn , Peter Weatherson, Josh Todd , Stuart McColm. SUBS NOT USED: Jack Breslin, Chris Dickenson,Jordan Brown,Dan Wadge. QUEENS PARK :William Muir, Sean Rooney, Sean Burn, Vincent Berry, Anthony Quinn, David McGregor, Paul Woods, Darren Miller (John Carter 66min),Jordan Moore (Ross McPherson 75 min), Shaun Fraser, Ciaran McElroy (Ryan Hynes 66 min). SUBS NOT USED: Bryan Wharton, George Samuel GK, Gavin Mitchelll, Conor McVey.